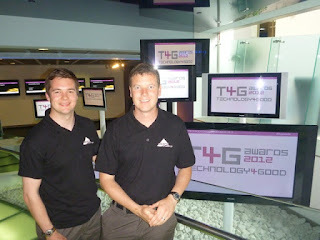 The use of technology at the Apex Challenge has been celebrated at a major national awards ceremony. Members of the organising team were invited to London for the Technology4Good awards, hosted by broadcaster Mariella Frostrup, which celebrated how a range of organisations use technology for the good of others. More than 200 entries were received for the 2012 awards and the Apex Challenge was nominated alongside three others in the innovation category. Judges were impressed by our use of technology at outdoor events as a way of encouraging more young people to take part in the adventure competitions. The winning entry in the innovation category was ActionAid, which does some amazing work with children in Africa and communities that have been devastated by natural disasters. To be nominated alongside such an organisation, and the others in our category was a huge honour and great recognition of how we have always tried to make the Apex Challenge stand out from other similar events. Coming in our tenth anniversary year also made it even more special. Spending the day in London was a great opportunity to hear about the good work carried out by other organisations and to tell people about what we do. We met some really interesting people and made great use of the huge chocolate fountain that was laid on! Apex up for national award! Over £1000 worth of prizes to be won!